I would like to look at Manphy from Unleashed, a card SBJ brought to my attention. Manphy has 60hp and an attack for one colorless: shuffle your hand into your deck and draw 5 cards. 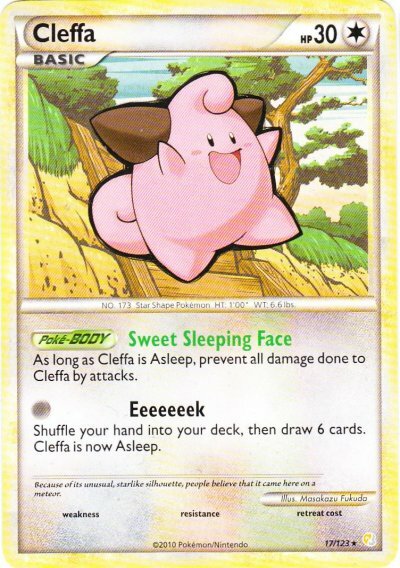 Some clear disadvantages to Cleffa are the energy cost, the addition of a weakness to electric, the loss of a card when you redraw your hand and not the invincible wall that Cleffa can become. I know that that is a lot but total of 60hp puts it out of first turn knock out against Tyrogue, an easy counter for Cleffa. It also helps put it out of Catcher KO range. There is also a price point advantage. Cleffa is $4.99 on Troll and Toad and Manphy, $0.99. This is, at the least, a good alternative for the casual player. Otherwise I think its time to retreat Cleffa back to the rare binder. I know every player out there may disagree but with Catcher being so prominent in the format leaving a 30hp Pokemon that you won’t evolve on your bench or even using it as your active turn, after turn, after turn is handing your opponent a prize. Alternatives I see are run more Prof. Oak’s New Theory or if you’re searching for really specific cards from your deck Sage’s Training is an underplayed card in my opinion. The open slot from removing that Cleffa could go to good use and is something to play around with.